No enthusiastic sky watcher ever misses a total eclipse of the moon. The spectacle is often more beautiful and interesting than one would think. To prepare for the rare event on Dec. 20-21, here are some tips to keep in mind. Click here for a table showing the times of all 12 stages in different time zones. This star chart shows where in the sky the upcoming lunar eclipse will appear. 1) Moon enters penumbra (12:29 a.m. EST/9:29 p.m. PST) The shadow cone of the earth has two parts: a dark, inner umbra, surrounded by a lighter penumbra. The penumbra is the pale outer portion of the Earth's shadow. Although the eclipse begins officially at this moment, this is in essence an academic event. You won't see anything unusual happening to the moon - at least not just yet. The Earth's penumbral shadow is so faint that it remains invisible until the moon is deeply immersed in it. We must wait until the penumbra has reached roughly 70 percent across the moon's disk. For about the next 45 minutes the full moon will continue to appear to shine normally although with each passing minute it is progressing ever deeper into the Earth's outer shadow. 2) Penumbral shadow begins to appear (1:13 a.m. EST/10:13 p.m. PST) Now the moon has progressed far enough into the penumbra so that it should be evident on its disk. Start looking for a very subtle light shading to appear on the moon's upper left portion. This will become increasingly more and more evident as the minutes pass; the shading will appear to spread and deepen. Just before the moon begins to enter the Earth's dark umbral shadow the penumbra should appear as an obvious smudge or tarnish on the moon's left portion. 3) Moon enters umbra (1:33 a.m. EST/10:33 p.m. PST) The moon now begins to cross into the Earth's dark central shadow, called the umbra. A small dark scallop begins to appear on the moon's upper left-hand (northeastern) limb. 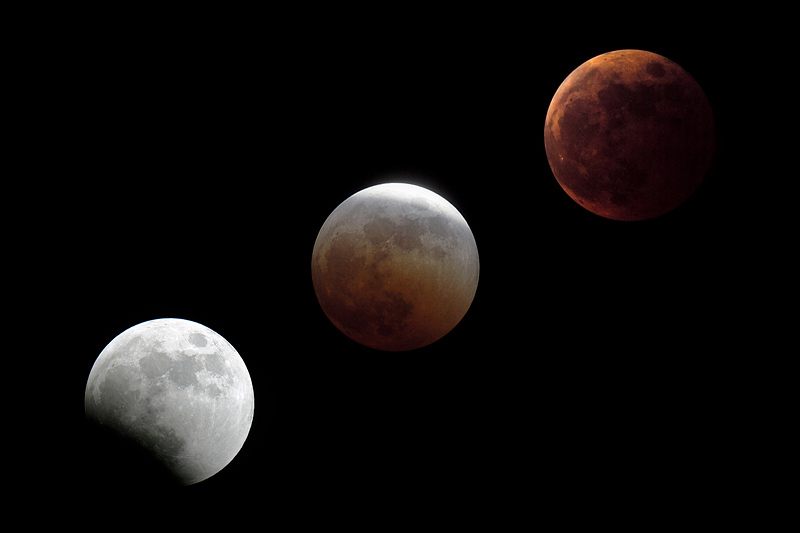 The partial phases of the eclipse begin; the pace quickens and the change is dramatic. The umbra is much darker than the penumbra and fairly sharp-edged. As the minutes pass the dark shadow appears to slowly creep across the moon's face. At first the moon's limb may seem to vanish completely inside of the umbra, but much later, as it moves in deeper you'll probably notice it glowing dimly orange, red or brown. Notice also that the edge of the Earth's shadow projected on the moon is curved. Here is visible evidence that the Earth is a sphere, as deduced by Aristotle from Iunar eclipses he observed in the 4th century B.C. Almost as if a dimmer switch was slowly being turned down, the surrounding landscape and deep shadows of a brilliant moonlit night begin to fade away. 4) 75 percent coverage (2:23 a.m. EST/11:23 p.m. EST) With three-quarters of the moon's disk now eclipsed, that part of it that is immersed in shadow should begin to very faintly light up similar to a piece of iron heated to the point where it just begins to glow. It now becomes obvious that the umbral shadow is not complete darkness. Using binoculars or a telescope, its outer part is usually light enough to reveal lunar seas and craters, but the central part is much darker, and sometimes no surface features are recognizable. Colors in the umbra vary greatly from one eclipse to the next. Reds and grays usually predominate, but sometimes browns, blues and other tints are encountered. 5) Less than five minutes to totality (2:37 a.m. EST/11:37 p.m. PST) Several minutes before (and after) totality, the contrast between the remaining pale-yellow sliver and the ruddy-brown coloration spread over the rest of the moon's disk may produce a beautiful phenomenon known to some as the "Japanese lantern effect. " 6) Total eclipse begins (2:41 a.m. EST/11:41 p.m. PST) When the last of the moon enters the umbra, the total eclipse begins. How the moon will appear during totality is not known. Some eclipses are such a dark gray-black that the moon nearly vanishes from view. During other eclipses it can glow a bright orange. The reason the moon can be seen at all when totally eclipsed is that sunlight is scattered and refracted around the edge of the Earth by our atmosphere. To an astronaut standing on the moon during totality, the sun would be hidden behind a dark Earth outlined by a brilliant red ring consisting of all the world's sunrises and sunsets. The brightness of this ring around the earth depends on global weather conditions and the amount of dust suspended in the air. A clear atmosphere on Earth means a bright lunar eclipse. If a major volcanic eruption has injected particles into the stratosphere, the eclipse is very dark. Because of the recent eruptions of the Eyjafjallajökull volcano in Iceland last spring and the Merapi volcano in Indonesia in October, one and possibly two clouds of ash and dust might be currently floating high above the Earth. As a result, the moon may appear darker than usual during this eclipse; during totality, parts of the moon might even become black and invisible. 7) Middle of totality (3:17 a.m. EST/12:17 a.m. PST)The moon is now shining anywhere from 10,000 to 100,000 times fainter than it was just a couple of hours ago. Since the moon is moving to the north of the center of the Earth's umbra, the gradation of color and brightness across the lunar disk should be such that its lower portion should appear darkest, with hues of deep copper or chocolate brown. Meanwhile, its upper portion - that part of the moon closest to the outer edge of the umbra should appear brightest, with hues of reds, oranges and even perhaps a soft bluish-white. Observers away from bright city lights will notice a much greater number of stars than were visible earlier in the night. The darkened moon will be near the constellation Taurus, just beyond the tips of the bull's horns and hovering high above the stars of Orion, the hunter. Before the moon entered the Earth's shadow, the temperature at the lunar equator on its sunlit surface hovered at 260 degrees F (127 degrees C). Since the moon lacks an atmosphere, there is no way that this heat could be retained from escaping into space as the shadow sweeps by. Now, in shadow, the temperature on the moon has plummeted to minus 280 degrees F (minus 173 degrees C). A drop of over 500 degrees F (300 degrees C) in only about two hours! 8) Total eclipse ends (3:53 a.m. EST/12:53 am. PST) The emergence of the moon from the shadow begins. The first small segment of the moon begins to reappear, followed again for the next several minutes by the Japanese Lantern Effect. 9) 75 percent coverage (4:10 a.m. EST/1:10 a.m. PST) Any vestiges of coloration within the umbra should be disappearing now. From here on out, as the dark shadow methodically creeps off the moon's disk it should appear black and featureless. 10) Moon leaves umbra (5:01 a.m. EST/2:01 a.m. PST) The dark central shadow clears the moon's upper right hand (northwestern) limb. 11) Penumbra shadow fades away (5:20 a.m. EST/2:20 p.m. PST) As the last, faint shading vanishes off the moon's upper right portion, the visual show comes to an end. 12) Moon leaves penumbra (6:04 a.m. EST/3:04 p.m. PST) The eclipse officially ends, as the moon is completely free of the penumbral shadow.